Skye Gravestones | Donald & Mary (McLeod) McCaskill. 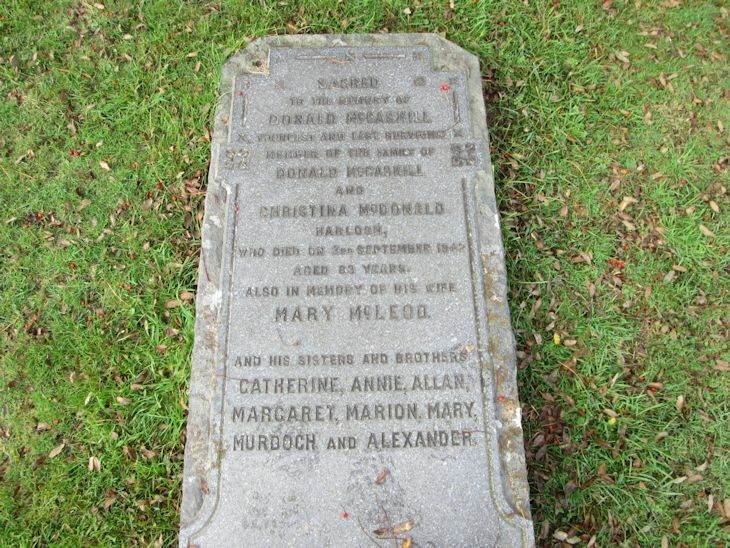 Donald & Mary (McLeod) McCaskill. Sacred/to the memory of/DONALD McCASKILL/youngest and last surviving/member of the family of/DONALD mcCASKILL/and/CHRISTINA McDONALD/Harlosh/who died on 3rd September 1942/aged 83 years/also in memory of his wife/MARY McLEOD/and his sisters and brothers/CATHERINE, ANNIE, ALLAN/MARGARET, MARION, MARY/MURDOCH and ALEXANDER.